Recently purchased this app for my daughter, who loves dinosaurs. Should have read more reivews first. While this app looks great and looks like it contains a lot of fun information that my daughter would love, we will never know. It crashes every time we open it, right after viewing the first dinosaur's stats-and I do mean every time. I have never gotten to view more than 1 dinosaur. Seems from reading many of the reviews, that this app needs to be updated to be compatible with IOS 8. Nat Geo, please fix this immediately. I spent $5.00 on this app, which is a lot in the app world, and want to see it fixed. Plus, my daughter was very dissapointed that she could not use the app. Once it is working again, I'll be happy to up my rating but until then it gets only 1 star (would have given it 0 stars as the app doesn't even work, but Apple doesn't allow that option). National Graphic is usually AMAZING in everything they do, but I've got to tell you, as much as it pains me... this app needs a LOT of work. Swiping from page to page crashes the program at times. The menu for the videos (which are very, very short, like ten of fifteen seconds short) is in portrait orientation only, but the videos are in landscape, so you have to spin the iPad around again and again. If you play "The Story" on one of the individual dinosaur pages and swipe to another page during the playback, the playback just keeps going and going. You have to pick another option (Dino Stats, Fun Fact or Picture Info) to stop the playback. This little glitch is particularly annoying. There are other minor glitches that make the whole app feel poorly constructed and not very well thought out. I, like most others who have purchased this app, are sitting by with our fingers crossed that a magic patch will come along and bring this C- app up to the A+ status we all think National Geographic should maintain. Bombs Away! CRASH CRASH CRASH CRASH! I’d like to see the 700 dinos but the app CONSTANTLY crashes! REFUND! After IOS 8 update crashes all the time. The app is extraordinary and extremely informational. However, maybe you should try considering adding animation to the pictorials along with environmental sounds ( e.g Alice app). Second allow landscape viewing. Lastly, you should add as a bonus section the prehistoric mammals that appeared after the extinction event of 65 m.y.a. The above would make your app the best there ever will be of this genre. Excellent job though. Looks good, but it isn't. Doesn't run well. Options stall or won't start. Dinosaur from A to Z have all the same images, so it is impossible to know which is which. I can't wait to share this with my son. A very cool interactive book with excellent illustrations. The hilarious over-the-top reading voice in the Dino-Facts just cracks me up. Dinosaurs, Hard-Boiled! Strong work. The reviews here are not accurate so I have to assume written or sponsored by the developer. This is an encyclopedia and that is it. It is NOT interactive in any way. It is a book. That is all. Definitely not for young kids. My 4 year old turned away in 1 minute and said "It's too old for me" There is no sound, no animation - not worth the price tag when there is far better out there like Dinosaur Zoo. AVOID THIS. I have a 3rd generation Ipad. I love the Dinopedia, but it keeps on crashing. Could you please update it and fix this bug. In the middle of reading, or passing a page, the app closes. Please fix it and add some new dinosaurs, and the app will get better. As soon as I read about it in National Geographic, I wanted it, now that I have it, I can't enjoy it that much because it crashes. Fix these minor bugs and all of us will be happy. Thank you. My kids and I were so excited about this, watched a video about the app, narration made it exciting for kids. But I cannot get past the first screen keeps crashing. Don't spend your money until it gets fixed! I did an updated, rebooted iPad and reloaded app, still did not work. I have had this app since the beginning and give it a 5 star rating but the latest revision is a mistake. I have used this app in the school where I volunteer and the children love to look at the videos. In this revision the videos are not accessible from the menu and it is very confusing to say the least and they are not listed in the index. In class you don't have time to search them out and I have tried to look for them on my own and have only stumbled onto one. Why? The Dinopedia is fine, but the YouTube video that previewed it made it seem like it was filled with narrated videos of many dinosaurs. It's not. There are few videos, and some of them are only about five seconds long. I'm disappointed in this app enough to write this review, and I'll think twice (or not at all) about buying apps from National Geographic in the future. The narrator is overly expressive and one of the most annoying I've heard, but my four year old grandson loves it, so I'll put up with it. Content and pictures are great! This app is great but it could use a few more dinosaurs. Crashes every time my son tries to open since iOS update. Boo!!! This app is AWESOME otherwise, my was my sons favorite app and saved me from reading the same dino book every night! Please fix!!!! You might not want to say that it the complete Dinopedia .I mean I couldn't even find Gorgonasaures . At least I think that's it's name you might wanna see"Walking with Dinosaures". You might also want to tell the reader that reads to people to put some feeling in it .It makes it sound boring. My little boys love dino's and this app has been a hit from the moment it finished downloading. It is a little buggy but nothing drastic. I would like to see more videos and longer videos but all and all a great app. I've been looking for this one as NG delivers typically great content. But this app is a mistake. Horribly works with content on the ipad - i.e. dino dev tree. And not much of content. With sound on the videos, it's perfect! Thank you for the great update--can't wait for my 5 yr old nephew to use this app! This is by far THE GREATEST app i've ever spent five bucks on! Not that I'm surprised, though, since this is National Geographic we're talking about. Don't buy it if you lick for huge amount of info. THIS... APP... IS... AWESOME!!!! I am a HUGE fan of dinosaurs and if you are too, you will really LOVE this app! Unlike the other Dino apps this has extensive information and great visuals. Well done!! This is a very good start, hopefully it will be improved with future updates... Great pictures, great content, and my kids really enjoy the app. That being said, my gripes are these: no flying reptiles included!, not sure if all of the dinosaur names are pronounced correctly in the audio portion, could have more videos and they could be longer... All-in-all, a very good start and highly recommended. The only thing I don't like is the terrible voice that reads the text. The app keeps crashing! For this price we deserve better! Come Nat'l Geo you can do better! You fix the app I'll change my review! Will not work in IOS 8, do not purchase! Was great, until iOS 8. Now useless. Needs to be updated to support iOS 8. Crashes immediately every time you try to use it. A very nice app with lots of great illustrations, but VERY inaccurate in several ways. Lots of misclassification. It should not be this way for a National Geographic product, especially when trying to educate the youth. I'm here to help if Nat Geo is ever interested. I swipe the pages too fast, it crashes. I try to go to T Rex from the index of dino names, it crashes. I breathe too deeply it crashes. What a terrible, amateurish implementation of what is a great idea and beautifully laid out views. The app crashes each time the app is opened. It appears to have happened after the IOS upgrade. My kid is quite upset. Please fix soon. This app is great and my main career is paleontology. Some of the facts are wrong and needs more dinosaurs. Also when I'm experience I'm going to lead a expedition to find a more intact Spinosaurus... which will probably never happen but I'm going to try. Otherwise this a great app for dinosaur fans. My 4 year old is stills enthralled with this app a week after we bought it. The information in this app is very good and as up to date as it can be. However, there are improvements that could be made for instance, the voice that pronunces and reads the dinosaurs is corny and overdramatic which takes away from the learning experience. Some of the pictures of the dinosaurs don't match their fact sheets. In the a's alone there are a number of the pictures that are incorrect. This also diminishes the learning that can take place. Kids will be able to spot many of these errors for the better known dinosaurs but for the lesser known ones they will learn incorrect information. Other than that the book is very good. The art is great! Great for dino-obsessed kids! Great illustrations and lots of information to feed hungry, young minds. However, the app crashes frequently. And the video clips are pretty weak. The app has a huge number of dinosaurs, which is great. At the same time, it suffers from a lot of bugs. Quite often, the screen goes blank, and my 5 years old child gets very annoyed. What a waste of money. Crashes after loading, when trying to select a topic. Have tried deleting and then downloading again. How can I get a refund? This used to be a great App, my grandson used it on his mother’s iPad and he also used it on mine. For months now, it’s been crashing with the first swipe on both iPads. I deleted it, and recently reinstalled in hopes that National Geographic would read the many reports of it crashing and provide an update. Alas, no… they can’t be bother with keeping an app working… guess they already made their profit. Don’t bother purchasing until Nat Geo fixes this issue. This app is a real disappointment. I thought a National Geographic app would be better quality. Sadly, this app crashes constantly & as another reviewer mentioned, there is no rhyme or reason to the order or any way to find the animations you want without scrolling through one by one, hoping not to have another crash during the search. Please fix! My three year old grandson could "play" dinosaurs for hours. He thinks this app is a big game because its fun to use while, at the same time, being extremely informative and interesting. He knows the names of so many of the dinosaurs and can recognize them immediately when we get to each one. This is what an App should be-- the graphics are marvelous, the entertainment value is superb, and the content is educational. What else can anyone ask? 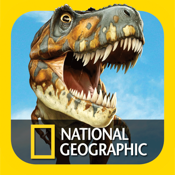 Buy this app if you or your children are even the least bit enthralled by dinos. You'll be glad you did!